“The BA Artificial Devices Policy has been amended to remove the requirement for players to have approval from their State Governing Body to use an artificial device (bowlers arm), or to have a medical certificate to use a bowlers arm. New policy as from 1 May 2019. 5.1.1.1 Each device is manufactured in several lengths and release mechanisms. defaulting player as per law C.2 and will forfeit the game as per law C.10. bowlers arm chosen by the player must stay the same during the match. the rolling of the jack, which can be rolled either by hand or by a bowlers arm. similar to law 52.4.3 and 52.4.4. 2. “I guess this means that winning an Open Event now guarantees you a place in a State Side, and you will no longer be over looked because you use an arm?” Ed. It would be appreciated if this could be circulated to all those for which update this may now be extremely relevant eg. district and zone websites, pennant, championship and tournament C.O.P, club notice boards, bowling magazines and newsletters, individual club members etc. Sincere thanks to Allan Starrett for this advice. Click here to read this great little poem by Peter Hemmens which amusingly and realistically sets out the pathway all “Armed Bowlers” must tread. You can find Peter at the Belmont Bowls Club (Geelong, Vic.). Thanks Peter. Getting Approval to use a Bowling Arm. Affiliated Bowlers must obtain State or Territory approval, up front, to use a Bowling Arm. In general, bowlers would present to their Club Secretary a medical certificate that states the members need to use an Arm. The Secretary signs an accompanying form and sends both to your State body. A card acknowledging that “approval is given to use the Arm” is posted to the applicant and the Club is advised. Your State body also advises Bowls Aust. of this approval and you name is included in a National Register of Arm users. The card must be available if requested. Many arm players will have Credential Cards that are unnumbered dating back over five years and will not have a number to include with their registration for the upcoming State Arm Titles at MCC Swinburne Avenue in January 2017. In this case we request players simply tick the form in the area requiring their Registration number and bring along the credential to the event and have it replaced with a new numbered credential that will be there for them. New credentials will only be handed over on receipt of the now outdated card and players will need to prove their certification prior to play. Below are links to the 3 “approved” manufacturer’s that may assist you in your purchase and choice of Arm. Let me say, they are all there “to help”! Some have better websites than others, but don’t let that put you off searching and choosing according to “your” needs here. Have “yourself” assessed by a Coach! Choose the Arm that suits YOU! 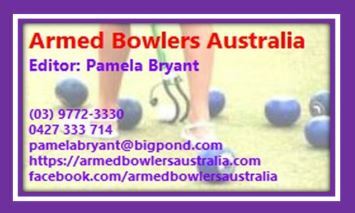 Click here to view a list of stockists, State by State, provided by Bowls Aust. MORE LATEST COLOURS!!! 19 OCT. ’18. Click here. Stardust and Shocked Yellow are going gang busters! Latest Colours/latest video from Greg, Click here. BLUE RANGE: French Blue, Blaze Blue, Pommel Blue, Space Blue, Navy. GREEN RANGE: Mistletoe, Classic Hawthorne Green. RED RANGE: Signal Red, Flame Red, Wineberry, Claret. YELLOW RANGE: Lemon Yellow, Safety Yellow, Orange. OTHER RANGE: Dark Violet, Copper Pearl, Anodic Bronze Pearl, Transformer Grey. The single arm below is a hold and release model (thumb release is also available). Two new colours have been added “Deep Pool” and “Pink” AND….a new innovation “Club Colours”, is also available. How good is that! In all 18 colours to choose from. The DHB Bowling Arm – Made and Designed in Australia – By Dean Winton and available from Hunter Bowls. Click here for the video on how to use the DHB Arm. Arm shown is a hold and release model. 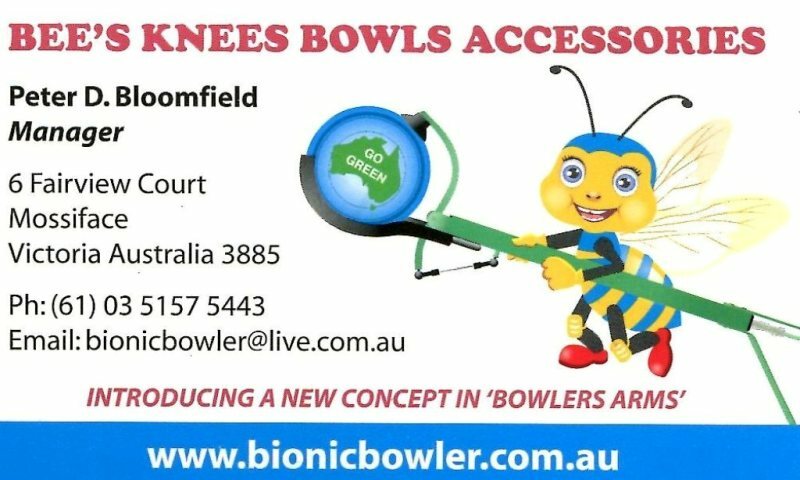 “The Bionic Bowling Arm” – Made and Designed in Australia. Available in left, right or centre push button release or hold & release. “The Dart Release” – Currently Made and Designed in Australia. To apply to use a Bowling Arm you need to download the Application Form relevant to your State, or ask your Club Secretary to arrange it for you. The latest “Laws of the Game” for Armed Bowlers. hand or by a bowlers arm. This rule change is effective immediately. To download the application for registration in YOUR State. Bowls NT. says “Lawn bowls is one of the few sports which can be played for a lifetime. There are various items of modified equipment which can enable a bowler to continue with the sport – long after their body first tells them it’s time to slow down! Bowls Tas. says “Bowlers in Tasmania do not require an application form to use a bowling arm, they simply need to provide a Doctors certificate to their Club confirming that one is required. They are included in the National Register. I think there are WELL over 10,000 bowlers using arms…..where would bowls be without all those memberships and expertise? Get with it, or perish. Peter are you in the WA Side for Moama, in September?